Hopefully it will be a great night for the UK and Lee Westwood or Poulter can win the US Masters..
A very Evernote and iPad rich collection of links this week. My first link for this week is to Issue 4 of the Productive Magazine. This is a MUST read for anybody interested in productivity and it is delivered as a free PDF that can be downloaded from this link. This will be great to read on your iPad, and I would if I had one! My second link is a link to a great review of the iPad version of Evernote. Some of the apps already out for the iPad make it look like a killer tool for productivity and this review of Evernote shows some of the sweetness of this app on the iPad platform. My third link is to the a post titled Getting Things Done With Things. This is a compilation of 6 excellent screencasts that show you how to use the excellent Apple Mac GTD Application, Things, to Get Things Done. Well worth a watch. My fourth link is a link to news about the online GTD Application, Nozbe, including Evernote integration into its online app. This is cool functionality that really does warrant a separate post and I will try to do one in the coming weeks. My fifth and last link is a link to a link about an Evernote event that is taking place on Friday April 15 from 1800 in New York City. This looks like a great event and one I would be going to if I was not the other side of the Atlantic Ocean! This entry was posted in Cool Software, General Items, GTD and Productivity Links, GTD Applications, GTD General, iPad Productivity and tagged evernote, gtd, iPad, iPad Productiivty, Productivity Links on April 11, 2010 by Andrew Mason. Congratulations to Evernote for getting their iPad client ready without actually touching an iPad! They used the iPad simulator that is built into XCode in order to built and test the Apple iPad client of their excellent software. Be sure to read the full blog post covering the Evernote iPad Client and also check out the video below. I do not have an iPad as I live in the UK but you can be sure I will have one on the UK Launch Day and this will be once of the first iPad applications that I review! Be sure to check out all the other posts I have written on Evernote. This entry was posted in Cool Software, General Items, GTD Applications, GTD General, iPad Productivity and tagged Apple iPad, evernote, iPad, iPad Productivity on April 5, 2010 by Andrew Mason. This white paper has been out a few days and I was meaning to blog about it sooner but only just got the chance due to my every increasing workload. So, here is the news regarding OmniFocus and GTD. 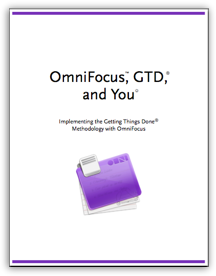 OmniGroup, the team behind the Mac and iPhone Getting Things Done app, OmniFocus have released an awesome and free white paper titled OmniFocus, GTD, and You. This is a 20 page white paper that looks at GTD and the way that you can implement it in a software application such as OmniFocus. Obviously this is very biased towards OmniFocus but the white paper is also of use and contains great information for those of you who do not use OmniFocus. The white paper starts with a statement from David Allen, the creator of the Getting Things Done Methodology. “OmniFocus is a stellar tool for keeping track of outcomes and actions in the Mac environment. It supports simple but important practices for keeping your head clear, staying focused, and managing your commitments.”, David Allen. Great for OmniFocus to get this endorsement from David Allen, and an endorsement that is well deserved. DavidCo, the company of David Allen are now promoting OmniFocus as their Mac GTD app of choice in their online store. I am not affiliated with OmniGroup or OmniFocus in any way so I have nothing to gain. I have used OmniFocus since the first beta versions and I have recommended it to many people. Be sure to check out this white paper and if you do use a Mac, give OmniFocus a try! This entry was posted in Cool Software, GTD Applications, GTD General, iPhone Productivity and tagged david allen, gtd, iphone, omnifocus on October 22, 2009 by Andrew Mason. GTD-Free is a desktop productivity application based on David Allen’s wildly successful philosophy as described in his “Getting Things Done” book. It joins the ranks of many other, similarly styled applications set on helping others to get the most out of their days while reducing the stress of organizing work. GTD-Free is, appropriately enough, a no-charge download which seeks to introduce new users into the popular organizational model through a simple, no-frills program. The aesthetic approach taken at GTD-Free is extremely basic and rather bland, especially in comparison to some of the other GTD modeled programs currently available for free download. Instead of focusing much on appearance, GTD-Free is more concerned about creating an extremely utilitarian experience meant to help get new user’s feet wet in the program. While the graphic approach of GTD-Free isn’t likely to win anyone over by itself, it should still be pointed out that the application is all very simple to navigate and learn which is a positive point. Luckily the fairly unimpressive visuals shouldn’t take away from the rest of the experience as it quickly becomes obvious that the developers of GTD-Free have taken great pains to create an excellent list of fundamental tools and features. All of the main GTD tenants have been covered in the program and they are done in such a way as to ensure that new users won’t feel alienated by any unfamiliar terms or types of sorting exclusive to the productivity philosophy. Categories are all established for next actions, maybe/someday actions, larger projects, priority listings and reminder dates. One of the best features is the ability to attach reference material (such as text documents, photo files and more) to appropriate work listings. Aside from this (and the solid inclusion of essential GTD aspects) however there isn’t too much that stands out as highly innovative in the feature offering. GTD-Free can run on pretty much any computer operating system from Windows, Mac to Linux and requires only Java 1.6 to use. Although there is no direct cell phone support the provided manual does provide a guide toward installing GTD-Free on applicable mobile devices. The main site itself makes it clear that GTD-Free is only in its early stages of development so it’s quite possible that greater portable access will be added with further updates and user demand. The manuals provided at the freeware’s website should help new users to quickly become acclimatized to the program although a forum would have been a welcome support addition while building something of a community in the process. As mentioned before, GTD-Free is one of the easiest programs of its type for unfamiliar users to get into however and this does go a long way toward ensuring that those just jumping into it have an easy enough time figuring out their way around. For users who want to try out a Getting Things Done styled application without worrying about cost, GTD-Free is a solid first program to download and take for a spin. The homepage statement regarding its current beta status and the implication of future updates makes it into a promising program to keep an eye on. There are definitely better options around for consideration but for those who want to try out the GTD productivity model without investing a lot of time or money, GTD-Free is certainly worth a shot. You can visit the GTD-Free homepage on Sourceforge.com by following this link. As always, I would love to hear any of your comments about GTD-Free or any other GTD Application. This entry was posted in Cool Software, General Items, GTD Application Reviews, GTD Applications, GTD General and tagged gtd app, GTD Applications, GTD-Free on June 24, 2009 by Andrew Mason. I hope you are not all sick and bloated after consuming your fair share of Easter chocolate! It is nice to be writing this from home as I have done the last two weekly link round ups on the train from Leeds to London. My first link for this week is a link to an Interview with David Allen from the Effing the dog blog. The interview is in two parts with a link to the second part being found via the link I provided. I would love to Interview David Allen myself and this is something I may try to make happen as I have some great questions I would ask him. My second link is a great post from Zen Habits titled Seven Productivity Tips for People who Hate GTD. Now I love GTD but the article still makes a good read. My third link is a link from Rob Corddry via Lifehacker about Getting Things Done as an Actor. Great read and great exposure for GTD! My fifth and last link is another Things v Hit List comparison. May as well read both of them at the same time to get two peoples takes on these cool apps. Well I am now off to watch the final round of the US Masters. It is shaping up nicely with Phil Mickelson making a charge! This entry was posted in Cool Software, GTD and Productivity Links, GTD Applications, GTD General, Motivation on April 12, 2009 by Andrew Mason. Action Tracker is a simple yet effective take on the productivity model advocated by David Allen in his “Getting Things Done” system. The program is based on the FileMaker Pro software and uses this basis to create a clean, functional and fairly minimalist design for users to sort and manage their tasks through. The official home of Action Tracker is at Macproductive.com but it appears that the site is no longer registered or the company has let is lapse out of error. The application can be still downloaded from various Mac Download sites for free. Visuals with Action Tracker are fairly average but ultimately succeed in the essential goal of encouraging easy navigation and access to the extensive feature set provided by the platform. Those already acquainted with FileMaker Pro should find a certain level of familiarity in the aesthetics presented here. Action Tracker possesses the same level of Mac sheen that most of the OS’ first-party programs host — a factor which ultimately works to make it into a clear and graphically sound choice for a productivity software foundation. Action Tracker’s strongest suit is undoubtedly the number of features made available by the program. 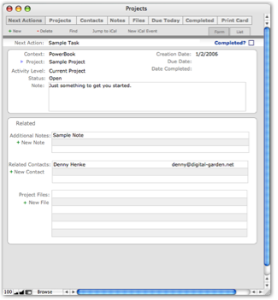 The aforementioned FileMaker Pro platform has enabled Action Tracker’s designers to offer a wide variety of options and customization for users to take advantage of. All of the GTD staples devotees have come to expect in software (to-do lists with contexts, reminders, status and so forth) are in place with Action Tracker. Each element of sorting and organizing has been paid good attention as well and the detail provided in sorting is fantastic. Users are able to micro-manage each item through the attachment of external documents (including Excel, PowerPoint, and Word file extensions aside the support for photo, video and PDF formats) while also enjoying the ability to link work with web and email addresses through a simple, clickable interface. List items can also be linked together for easy reference across the system, a touch which aids in ensuring smooth navigation and speedy movement from project to project. Action Tracker could have benefited from the inclusion of mobile application support but it’s clear that Denny Henke, designer of the system, is working on a limited budget so far. The system makes up for this shortcoming with the presence of a feature which prepares selected lists for note card printing, a low-tech but ultimately effective method of addressing portability for serious, regular users. If there is a major flaw in the Action Tracker system it can be attributed to the previously mentioned strengths in feature creation. Although the FileMaker Pro foundation allows for a fantastic level of customization and depth to the software, the uninitiated may have a fairly difficult time figuring out how to get started with their work. The program isn’t overly complicated but learning its intricacies is somewhat daunting for those who are being exposed to FileMaker Pro for the first time via Action Tracker. A greater level of community involvement could have gone a long way toward addressing the issues with Action Tracker’s learning curve. While users are still able to seek out guides, tutorials and forums through external sources, the main project homepage lacks in any real aid for those just taking the system for a spin. The creation of a hosted message board or tutorial would go a long way toward helping out novices with getting the most from the system and will hopefully see an appearance in the future. Ultimately Action Tracker is a solid choice for GTD adherents who are enticed (rather than put off) by the idea of a productivity platform which requires a good amount of invested time to warrant proper results. Their may be an issue with the ongoing support and development for the application as it would appear that the domain is no longer being used by the team behind Action Tracker. The fairly no-nonsense approach to Action Tracker’s core features combine with the depth and customization possible within them to create a difficult but rewarding productivity system. 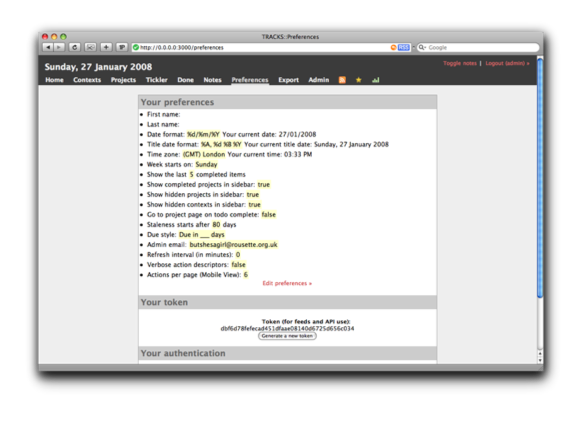 This entry was posted in General Items, GTD Application Reviews, GTD Applications, GTD General and tagged Action Tracker, FileMaker Pro, gtd, gtd application on March 8, 2009 by Andrew Mason. 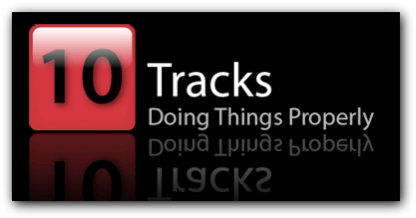 Tracks GTD is a Ruby on Rails web-based application that is meant to serve as a hub for users to organize their life and work within. The system is an open-source (hence, free) program from the Tracks team of developers and is an impressive platform which offers relatively immediate accessibility for anyone new to the application. Tracks GTD looks great and is easy to get running as the installer even includes the WEBrick Webserver. The program runs smoothly on Windows and Mac operating systems alike. There is a bit of clutter to get used to but nothing is so bad that it will get in the way of day-to-day use of the system. Everything looks very clean with functionality having obviously been placed as a priority of the design contributors working on Tracks GTD. The homepage for the application isn’t too pretty but this shouldn’t be much of a deterrent for most users as it isn’t necessary to view every time the program is run. Considering the level of in-depth coding which has gone into the Tracks GTD platform, the design does a great job of highlighting significant aspects of the program while stepping out of the way enough to ensure quick, smooth load times. The interface hosts a lot of great features and represents a solid array of the organizational plans or tools set forward by David Allen in the Getting Things Done Methodology. Everything is extremely customizable, a fantastic trait for users who wish to play with the system and tweak it until it’s set up for the model that can provide them with maximum efficiency. The system automatically refreshes new data entries and allows for quick updating of various categories and sub-categories (including GTD staples like Projects, Tasks, Next Action, and Someday/Maybe groupings) along with different geographical contexts (like at home, at computer, at phone and so forth). Users can receive RSS, iCal and plain text feeds as well as highlighting and display options which pop-up tasks scheduled when they are chronologically relevant. There is also a stat feature which displays your productivity over a set period of time through a visual display, a feature which isn’t really important but that still provides a bit of satisfaction for having achieved set goals and projects. Some of the options are fairly unnecessary but, just the same, Tracks GTD doesn’t have any glaring flaws that should hold anyone back from giving it a try. One of the best aspects worth mentioning in an overall review of the system is that of Tracks GTD’s ongoing development. The open-source nature of the application makes it encouraging for feedback and new designs to be submitted to the Tracks team from those who have adopted the platform as part of their organizational process. This level of user interaction fosters a sense of community and encourages even better versions of Tracks GTD to be released in the future. While there are other GTD organizational systems worth looking at, Tracks GTD is one of the best, downloadable options out there for those looking into implementing a GTD app in their daily life. 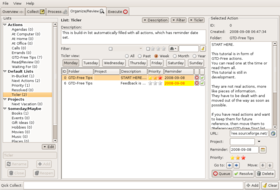 The platform is fairly unorthodox in terms of information input and display but Tracks GTD is also one of the most unique and deep programs currently available. For that feature alone, it’s a good idea to take it for a spin yourself and see if it’s the right productivity tool for your work and life style. Be sure to check out this Tracks Screencast that is in Quicktime format and as always, I love to hear your comments! This entry was posted in Cool Software, General Items, GTD Application Reviews, GTD Applications, GTD General and tagged gtd, Ruby on Rails, Tracks on February 20, 2009 by Andrew Mason.